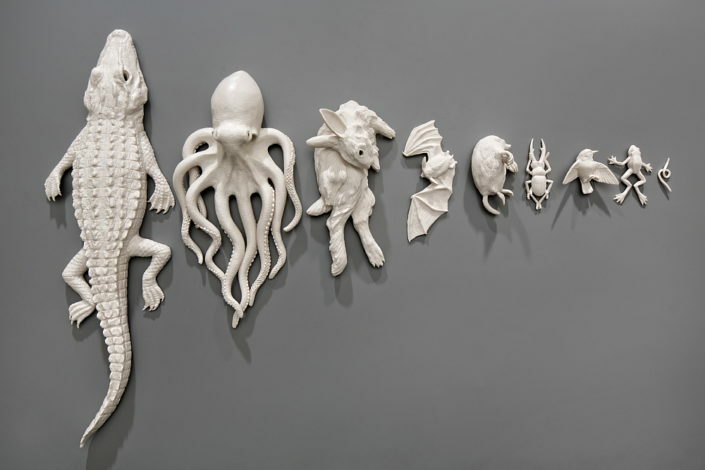 MIAMI, FL—Mindy Solomon Gallery present its first solo exhibition of sculptural and installation-based works by Portland, Oregon-based artist Kate MacDowell April 10th-May 22nd, 2015 in the Wynwood arts district. An opening reception for ‘Completely Exposed’ will take place Friday, April 10th, from 6-9pm. Mindy Solomon Gallery is located at 172 NW 24th Street, Miami, and proud to represent the incredible talent of Kate MacDowell. 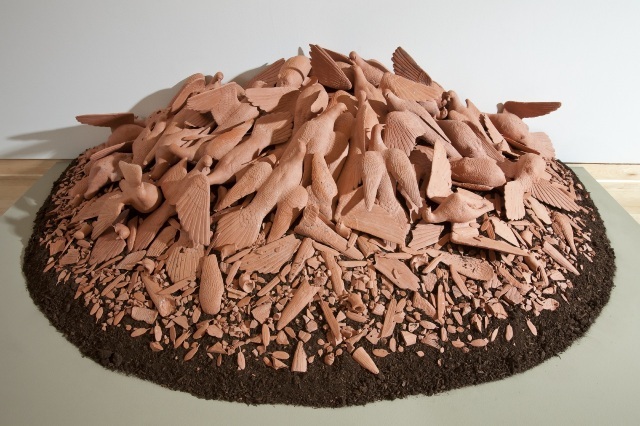 “We are excited to present this new body of work as a voice for contemporary sculptural narrative and environmental awareness,” said gallery director Mindy Solomon. Kate MacDowell’s intricately articulated sculptures and installations convey a sense of fragility and preciousness in the human relationship to the natural world. Her depictions of sculptural animals serve as a metaphor for the sense of need and loss felt in an ever-changing, insensitive industrial society often driven by greed and corporate profit. The figures’ piercing gazes aim to force the viewer to confront their own mortality. Kate MacDowell states: “My newest work explores our physical and psychological relationships to the animal kingdom. Whether as proxy, trophy, raw material, or mythic symbol, animals currently occupy a space in our subconscious which layers history, fable, and an awareness of species fragility. MacDowell explains: “Again and again, we look into the alien and find our own reflection—whether in the martial behavior of ants or in dreams of flight. We rely on the sacrifice of primates in laboratories to ensure the health and survival of our own offspring at the same time we look to our origins—our most primal selves—in their behavior and familial bonds. The use of fur and hide in fashion links to our earliest attempts to psychologically clothe ourselves in order to experience other states of being. 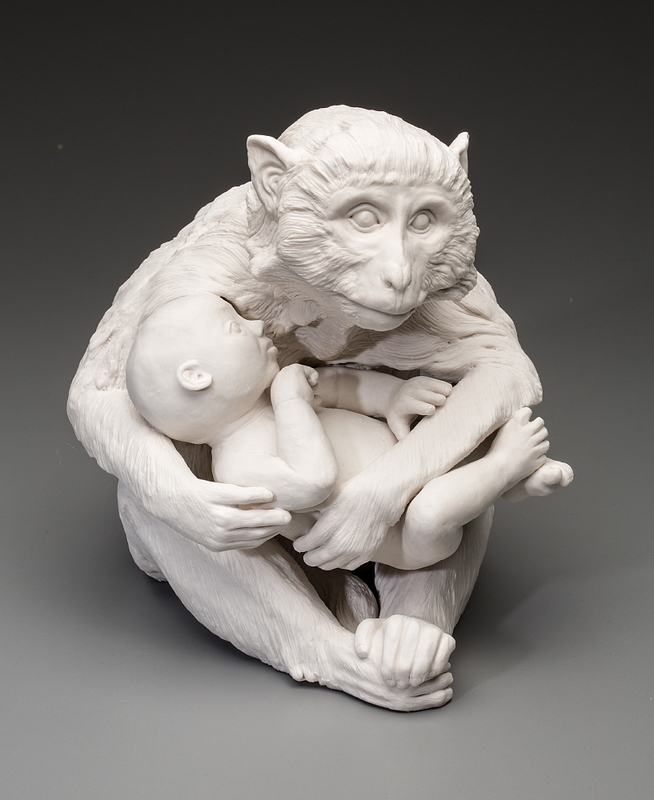 Kate MacDowell has been honored with a Kohler Artist Residency and an RACC Professional Development Grant, Zelli Porcelain Award short-list, Lincoln Arts & Culture Foundation ‘Best of Show,’ NICHE Award for hand-built ceramics, CraftForms Visionary Award of Excellence, Oregon College of Art & Craft Individual Merit Award, Penland School of Crafts scholarship, and Kiln Gold Residency at the Watershed Center for the Ceramic Arts. Her work has been exhibited widely throughout the US and England, and published in North America, Europe, Australia, and Asia. Her installations appear in the permanent collection of the John Michael Kohler Arts Center (Wisconsin) and many private collections. She lives and works in Portland, Oregon, and holds a BA and an MAT from Brown University in Providence, Rhode Island.